Like many people here, I have found one of the frustrating parts of academic writing is the referencing. Unless you did an Extended Project Qualification it’s unlikely that you’ll have had to use referencing before you came to University, and are probably thinking it’s a very time consuming thing to do. On Windows, go to the ‘References’ tab. 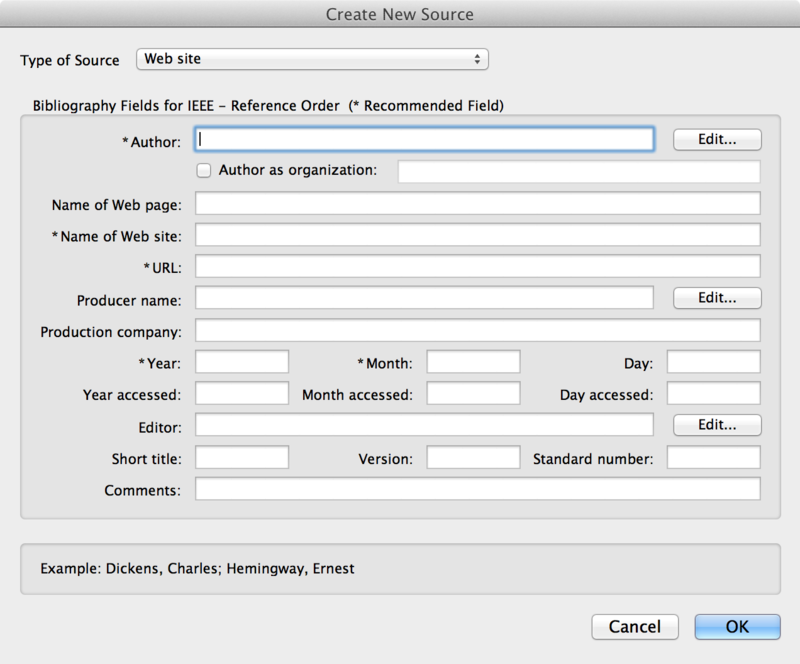 In the ‘Citations and Bibliography’ section and change the ‘Style’ to ‘IEEE – Reference Order’. On OS X, go to the ‘Document Elements’ tab. In the ‘References’ section select ‘IEEE – Reference Order’. Rather than duplicate many other tutorials online that teach you how to use these great features, I’d encourage you to look at the instructions linked to here and a video tutorial here. Once the IEEE referencing style has been installed, for each reference all you need to do is enter source material when asked (and it only asks for that which is relevant to the source format – see below). From there, the reference and bibliography are generated automatically and Word will keep track of your references for later use. This entry was posted in Computer Science and tagged citation, cite, IEEE, office, reference, referencing, word on February 24, 2013 by Sam.